There was a variety of fun classroom activities, including the very challenging ‘Marshmallow Tower’. The students were all given an excellent insight into how the Halewood plant operates with behind the scene visits to several parts of the factory. There was fantastic support as always from around the plant. A big thank you to; Ged Thurston and the team in Paint, Dean Pennington and the team in Training and Marc Powell and the team in Press Shop. Visit @JLR_EBPC for even more pictures and feedback from this great day. All the young visitors enjoyed the course, as you can see from the great feedback they gave. Look out for details of our next IYE holiday course which will be running during February 2018 half-term. "Awesome, enjoyable – everybody should come. The activities are amazing and making friends is easy." "Lots of good information with good, interesting activities." "An amazing course – will definitely blow your mind!" "Very good and educational gives you a real taste of factory work." 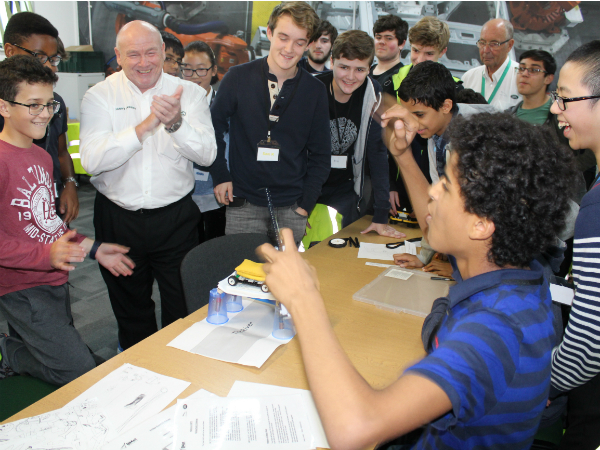 "A fun and interesting course with an insight into what happens in a car factory." "An interesting experience that gives you lots of new skills." "It was extremely enjoyable – like looking into the soul of cars." "It was fun, interesting, exciting and helps you build team skills." "Amazing, enjoyable, happy – Whoohoo!!"